All thing salted caramel seems to be the rage right now. Enjoy a slice of this Salted Caramel Brownie Cheesecake Pie with a hot cup of coffee after dinner this week. You will be hooked too! I’m sure you are questioning my sanity right now. I mean another salted caramel dessert? My latest hobby/job is food photography, and the need to buy cute inexpensive props comes with that. This is another subject I would like to move from quickly. Let’s just say I have enough plates, napkins, and straws to last a life time. My kids get excited when they see me using the straws because they know this is the only time I let someone use them. What?!? They would use them for every single drink, and then when I need a particular color, it would be gone. Yes…I have hoarding problems. So anyway, about this pie. Currently I just can’t get enough salted caramel flowing through my veins. Clearly! So when the thought hit that I needed to incorporate it into a brownie cheesecake, I couldn’t get into the kitchen fast enough. This happened to be another dessert that I had all the ingredients for in my kitchen. Remember? I said I had hoarding issues. That also applies to all sorts of baking ingredients too. It’s perfectly normal to find brownie mixes, Rolos, and pie crust just lurking around in my cupboards and refrigerator. And not just one, there are usually multiples of said ingredients. I used this Peanut Butter Snickers Cheesecake Brownie Pie as my base and slightly tweaked it to include all things salted caramel. A little bit of coffee in the brownie mix gave it the hit of mocha that I wanted. 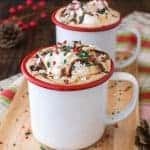 For those of you scared of coffee in your chocolate. Don’t be! You really cannot taste it at all. Now I’m sure you are wondering why add it then. 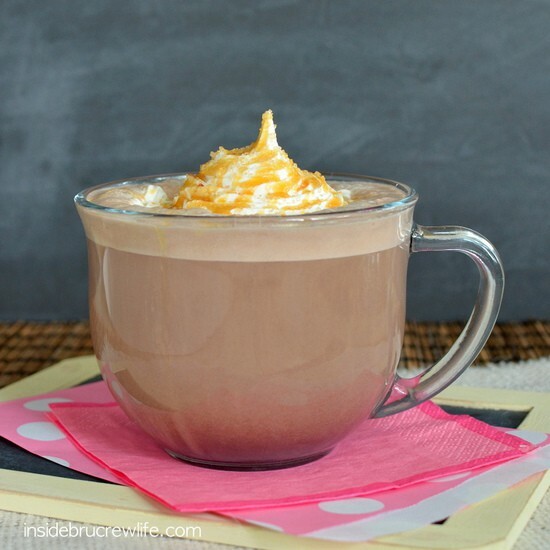 The coffee just enhances the chocolate flavor and makes it better. Trust me on this. And if you have trust issues with your chocolate, leave it out! It’s won’t affect the pie at all. Salted caramel goodness all wrapped up in a pie crust. Now that’s what I’m talking about. 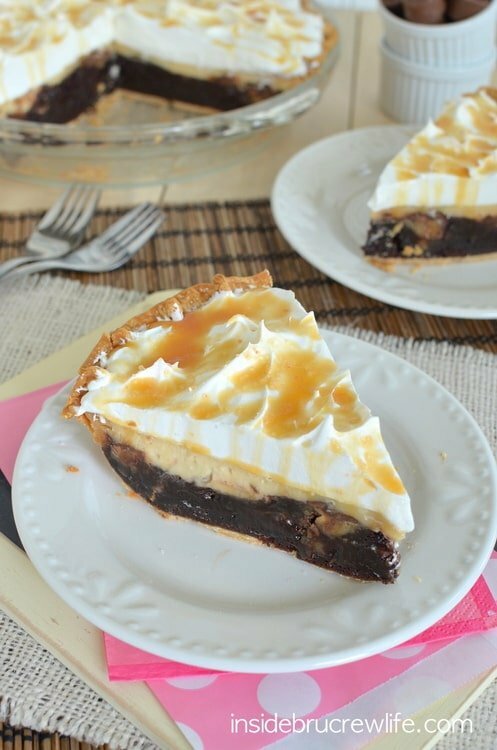 Who wants a slice of this salted caramel brownie cheesecake pie? Mocha Brownie pie topped with salted caramel cheesecake and Cool Whip. Unroll the pie crust and fit into a 10 inch pie plate. Crimp the edges and set aside. 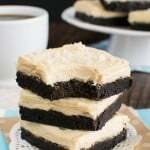 In a mixing bowl, combine the brownie mix, coffee, egg, oil, and water. Whisk until combined. The batter will be very thick. Spread in the pie crust. Bake at 350* for 30 minutes. While the brownie is baking, place the cream cheese, caramel topping, sea salt, egg, and sugar in a mixing bowl and beat until creamy. Stir in the halved Rolos by hand. When the brownie is done baking, remove from the oven and spoon the cheesecake batter gently on top. Spread out very gently. Place back in the oven and bake another 25 minutes. Remove from the oven and let cool. Refrigerate until set. Cover the chilled pie with Cool Whip. Drizzle with caramel and sprinkle with more sea salt if desired. Keep refrigerated. Cut into 12 slices. *Do not use the ingredients and directions on the back of the brownie mix. **Make sure your sea salt is a COARSE ground salt!!! Fine ground will make it too salty!! 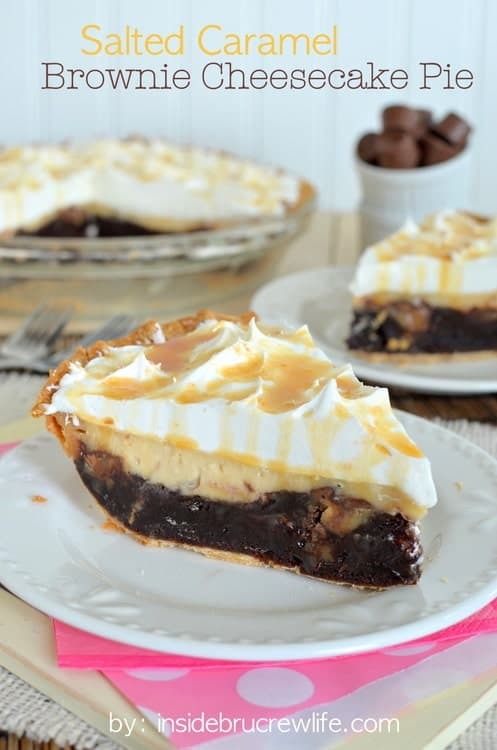 I’m not questioning your sanity, I’m questioning why I don’t have some of this pie right now! 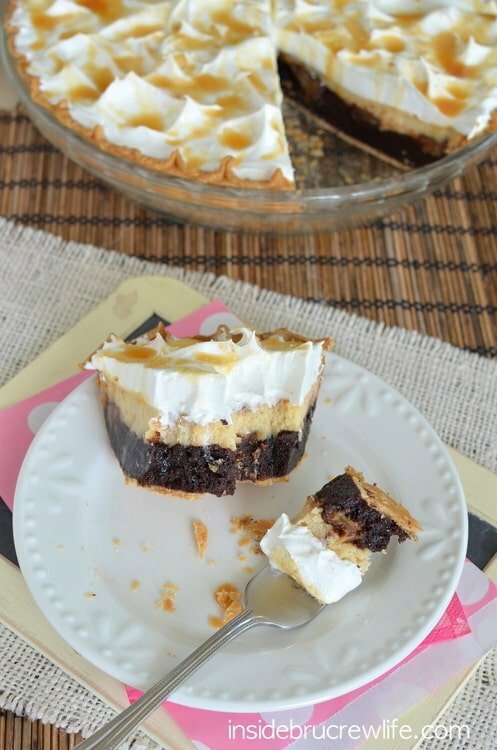 🙂 I love all the different elements to it – caramel + brownies + cheesecake in pie form! That sounds like the best idea ever. 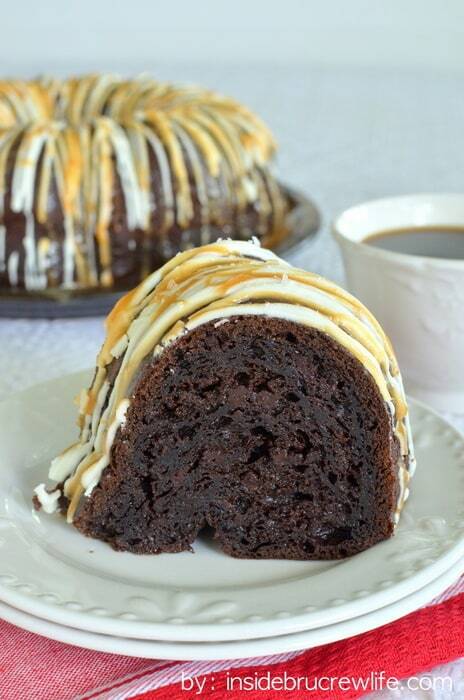 The caramel Hershey kisses would work too…although those I would freeze first before adding to the batter. I am a fan of the “fake” stuff, but feel free to use whatever you like. I would probably just put the whipped cream on slice by slice because it doesn’t hold up as long as Cool Whip. I hope you enjoy it!!! I just noticed the “12 slices” – you’re kidding, right?? LOL I guess that all depends on how large or how small you cut them. It is a really rich pie, so I cut them smaller. 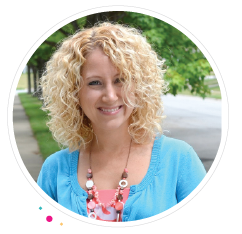 Oh my, your first couple paragraphs described me to a “t” – like the scrapbooking … I have more paper, stickers, stamps, and unnecessary supplies that you can shake a stick at. And I’m well on my way to hoarding napkins. I’ve been known to take them from parties because I like them so much …. Anyway! 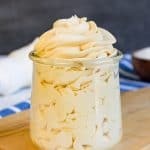 Wow, I saw this title and thought “this is the holy grail of all desserts” (sorry if I used that wrong, that was just my first thought) You combined everything amazing in this. Wow. Just wow. Pinned! 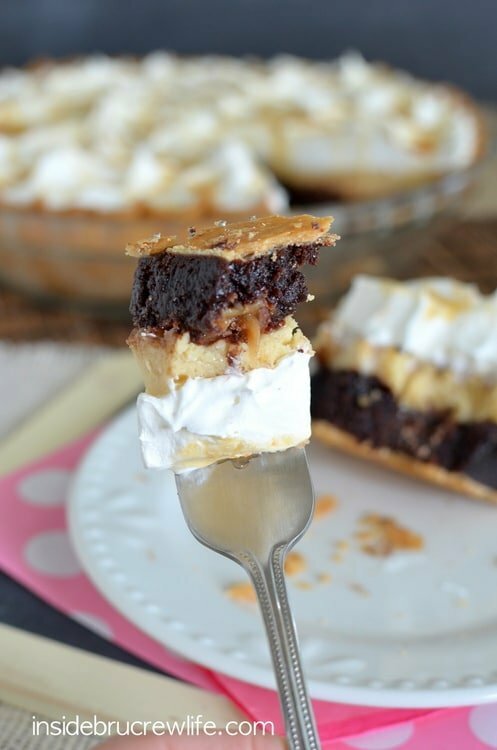 This pie has SO much going on – carmel, brownies, cheesecake, cool whip – I’d love a big slice!!! OMG – I am dying over this! Crazy delicious! I think you need to make this, bring it to me ASAP, that is all. I am loving all these lovely recipes. They just looks so yummy!!!! I am going to have to try the coffee and the chocolate cake. 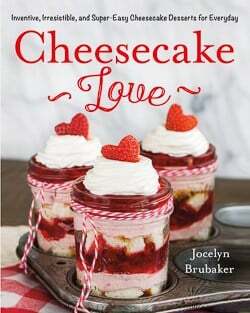 I love all things salted caramel, chocolate and cheesecake! This might be a little slice of heaven! I find it so cute about the kids with the straws, mine love to eat the piece I took a picture of. They keep track who had the special piece last time! Love this crazy pie! All the layers are incredible and you can never have too much salted caramel! Well this looks YUMMY but I really came to comment on the hoarding issues LOL – I am a stamper myself – well WAS. I kinda gave it up when I had to go back to work but still my stuff sits in my “area” (I don’t even have a whole room …. just a space in the rec room). I’ve started selling it but my GOSH – who the heck bought all this STUFF?! It could NOT have been me! Haha, that’s totally me!! Thanks Michelle! I am the same way! When I get onto something, I go full speed ahead. And hoarding – for sure! I’m so in love with collecting photo props right now! Oh, Jocelyn. You’ve done it again. You’ve made me want dessert before 8am. 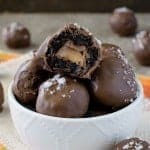 That photo with a bite showing all the layers? I’m drooling! Keep the salted caramel desserts coming. You can never go wrong with more. Haha my kids are the same way with the paper straws! This looks good! WOW! This looks amazing! I need to invest more in props and such. And I’m still trying to figure out that backdrop thing with my photos. I need to go to a workshop on it because the whole white poster board thing is lost on me. This pie though would fit in nicely with my fall appetite. Does that make sense?? I’m talking crazy. It’s because I’m hungry. 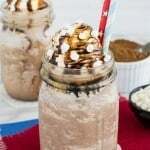 I need to make this. Right. Now! I’m the same way – if I love something enough, I can eat it for days and days and days in a row. And I totally relate to the food prop problem. Plates and bowls, oh my! Every word in this pie’s title is calling my name. When I saw this on IG the other day I just about died. Seriously over the top and amazing!!! 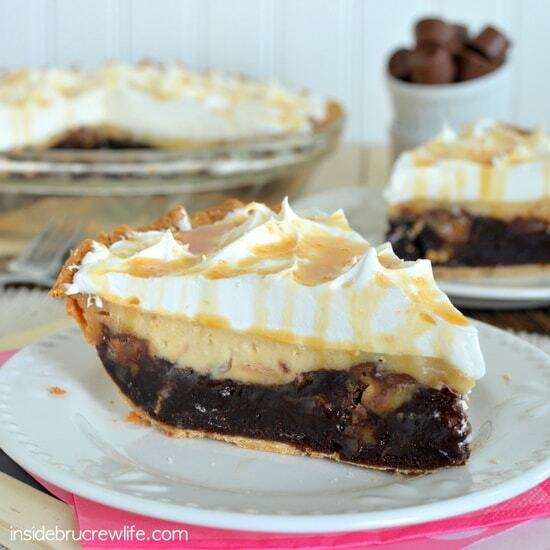 I want this so badly- the pie crust, the most brownie, the salted caramel.. oh goodness this is one fabulous pie!! Drooooling! This looks beyond amazing. Salted caramel everything is delicious and paired with brownies and cheesecake, I can’t even imagine the deliciousness. 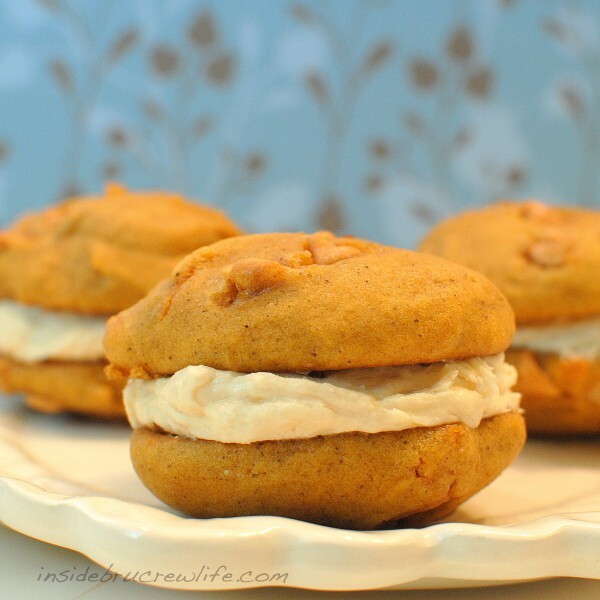 Girl, you are just killing me with all the salted caramel goodness you share! It’s like dessert heaven! 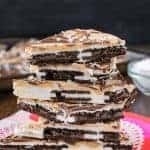 There’s absolutely nothing wrong with hoarding baking supplies when it means you can have treats like this made without having to go to the store!! 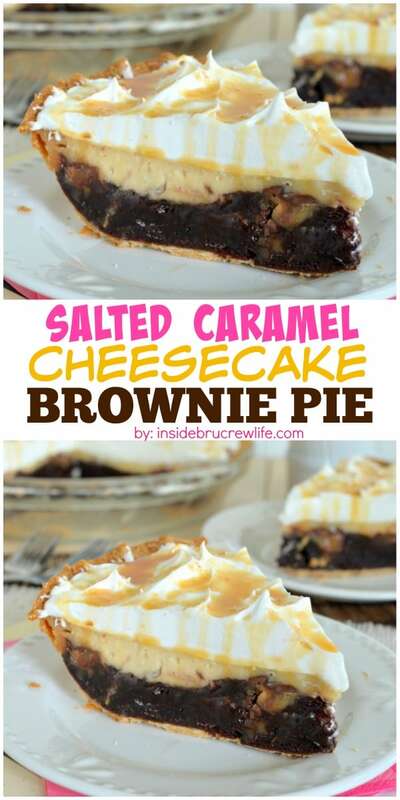 The combo of salted caramel + brownie + cheesecake sounds delicious! My niece made this pie, followed these directions to the letter. It looked extremely delicious. But it was not. Within seconds, my tongue became mummified due to the salt. This may be good if all of the salt was left out completely, but most of the pie ended up in the trash. But it looked beautiful! I’m sorry to hear you didn’t like the pie. Salted caramel is something you have to like. The extra sea salt for the top does say if desired. I wouldn’t have thrown the entire pie away though…maybe just gently scrape off the very top layer and enjoy the rest. Everyone has different tastes. We happened to absolutely love it this way, and I have had other readers email me saying how much they liked it. I’m sorry you didn’t like it! Hey, Super excited to make this! I may be just missing something but I can’t seem to find where the second half of the rolos go. I see half in the cheesecake batter…. I’ll see if I can find it, otherwise can you help me out? Thanks a million! Holy moly. There is nothing in the recipe that I don’t like … which means it’s filled with everything I love! Putting this on my “to make” list ASAP!